1912 Edwardian reception gown in grey silk chiffon over ivory China silk embellished with hand painted metal shells. The upper bodice and sleeves are ivory lace over cream silk. The standing collar down through the throat is made up of pleated silk tulle set with appliqued lace. Satin covered discs accented the neckline between chiffon and tulle. They are also used at the sleeve hem. The chiffon on the bodice is pleated just above the waistline seam to create a cummerbund effect. The bodice is fully boned. The skirt is gently gathered into the waistline seam. Decorating the reception gown are these amazing iridescent metal shells all hand painted and hand stitched in place. There are various sizes throughout the gown. They are made to look like fresh water pearls. There is only a couple of missing and a few loose on the gown. The gown closes up the center back with original hooks and eyes. The skirt is slightly longer at the back and trains out behind the dress. The dressmaker’s label is intact. The China silk lining or under-dressing is showing some shatter. I have tried to photo these spots but it is safe to say that the dress is perfect for display and collection but to try and wear the gown you would have to undertaking a relining of the garment. An absolute stunning example of Edwardian fashion, style and grace. Make sure to ask all questions before buying, as with antique garments there are always flaws due to the age. I can only upload 12 pictures so if you want to see more let me know and I will send you additional photos, there are about 10 or so more. 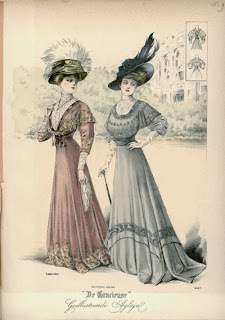 The above is a fashion plate from 1908. (hehehe, that rhymes!) You can easily see the similarities between the gray gown on the right and the extant gown in both the bodice neckline and the shaping of the skirt. The sleeves are more similar to the dress on the left of the fashion plate. So, although I have no doubt there were women wearing a similar style in 1912, this dress probably from a few years earlier. I think I might have to make something like this...in blue and purple. Wow, the decoration (wtf, where can I get these iridescent metal shells) is gorgeous. This dress is a masterpiece. Is one of the best edwardian dresses I've ever seen. I've seen a few places where you can get shell beads. This place sells purple ones that look somewhat similar. It is a pretty amazing Edwardian dress.